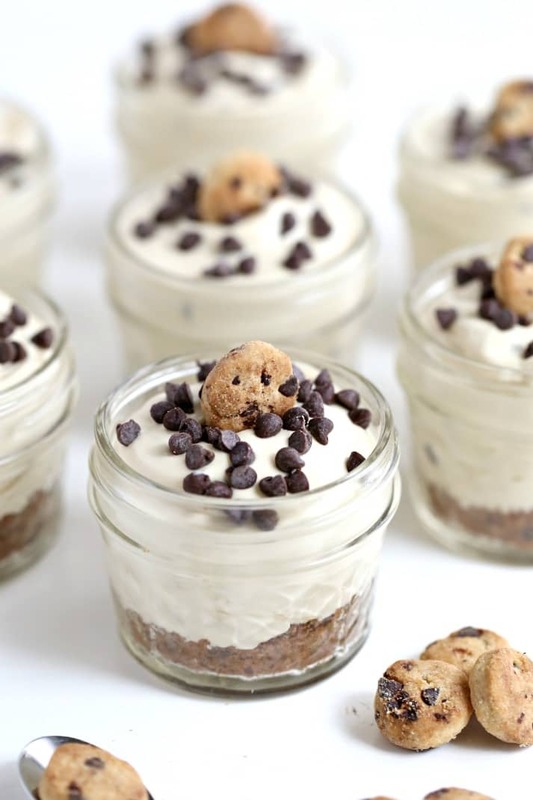 Chocolate Chip No Bake Cheesecakes - Chocolate Chocolate and More! 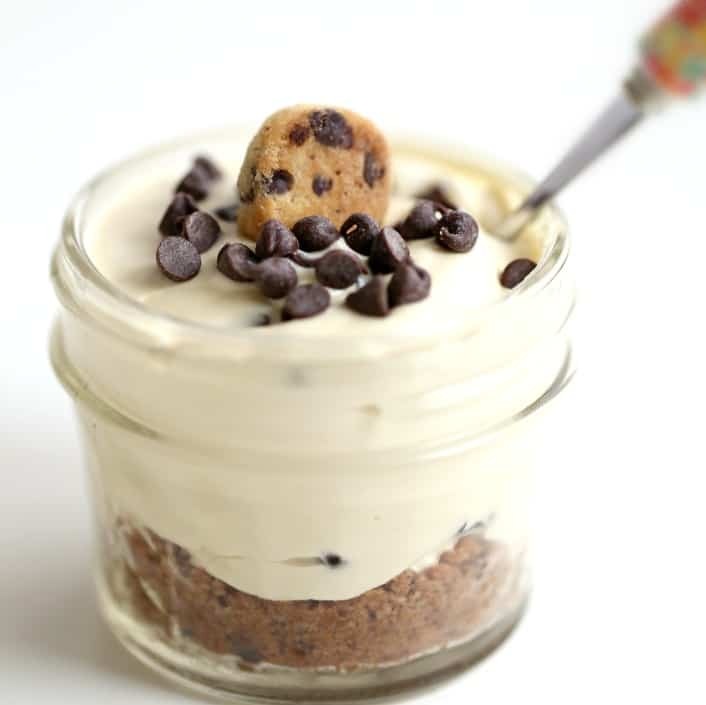 Chocolate Chip Cookies are a favorite, and these Chocolate Chip No Bake Cheesecakes will so become a favorite too! Hi! I’m Diane, I love making recipes that will impress my friends and family that are not overly complicated. 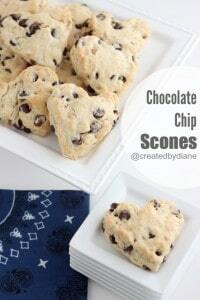 Sharing my passion for food with others has always been a so exciting and I share all my kitchen adventure of sweet and savory recipes at Created by Diane (www.createdby-diane.com). Somedays though heating up the oven and breaking out the cookie sheets just seems like too much. Tell me I’m not the only one who feels that way! 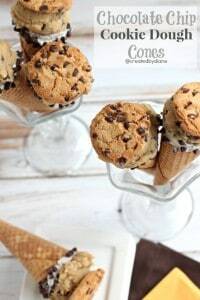 A lot of times, those days happen when we’re having friends for dinner on short notice and I need a dessert that actually takes minutes to make. Now this doesn’t look like it only takes minutes, and it doesn’t taste like it only takes minutes, but it does. In about 10 minutes, these will be all finished and then you put them in the fridge to chill for an hour. By the time dinner is finished, they will be ready! 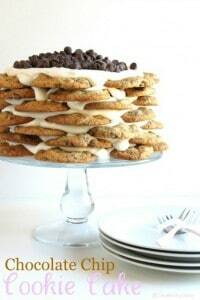 The crust is made from chocolate chip cookies. I used Chips Ahoy Cookies, if you already have fresh baked cookies, go right ahead and use those. I used a food processor to crush the cookies and mix them with some butter. Alternatively you can simply put them in a plastic bag, and roll a rolling pin over them a few times to crush them up, then open the bag add the butter and mix it up by smooshing it together. 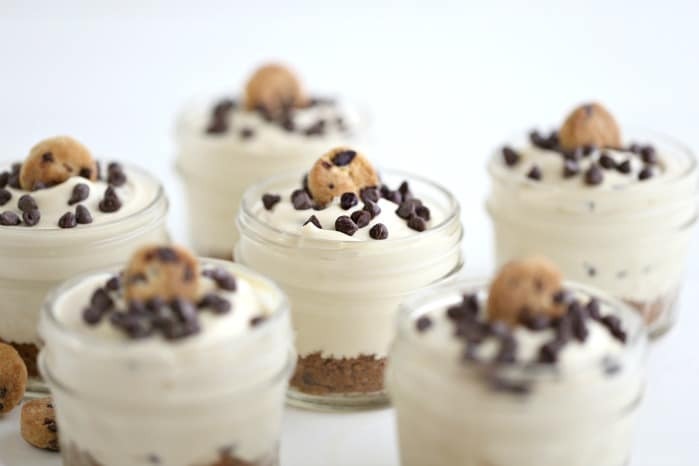 I made these cheesecakes in 4oz jars. You can use any jar, glass, or cup you prefer. If you won’t want any clean up after eating them, use clear plastic cups. In food processor blend cookies with butter. Then press a tablespoon and a half of the mixture into each jar. Press the mixture so it's firm in the bottom of each jar, otherwise it will get all mixed in the cheesecake batter and won't be on the bottom. Next add in the brown sugar and mix until it's well blended, then add the vanilla extract nd heavy cream. Whip until the mixture is fluffy. 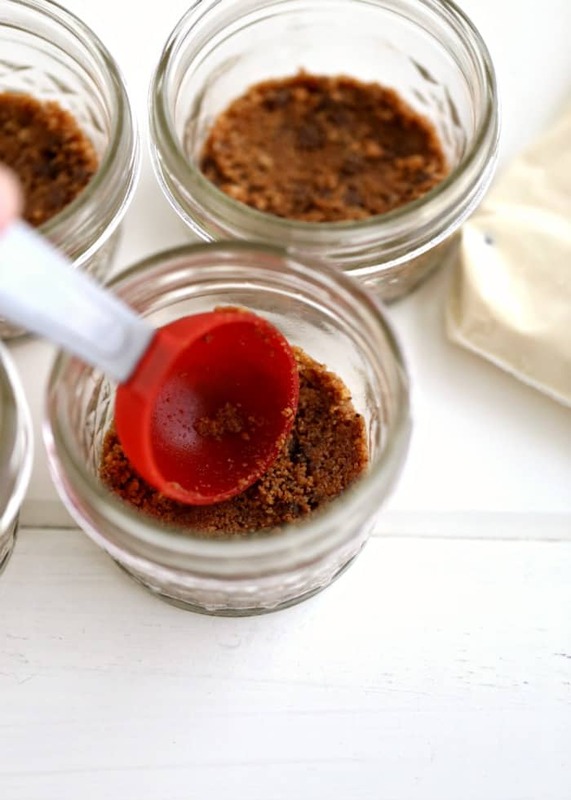 Place mixture into a gallon plastic bag seal it, then cut off one of the bottom corners and pipe the batter into the jars over the cookie crust. 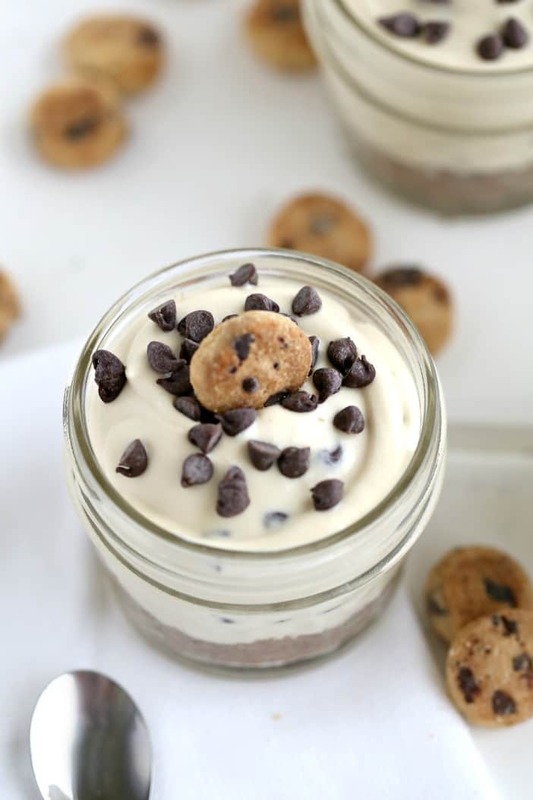 Top the jars with the remaining chocolate chips and a small cookie. Place jars in fridge to chill completely. At least an hour. If you want to place the lids on the jars, don't fill each jar so high. These make great gifts too. You can make them a day or two ahead of time, which is also nice! Hi Julianne, how much heavy cream should I use for the cream cheese batter? Also,with other recipes that need a layer to stay in place, I put the layer in the container and then place the container in the freezer for about 15 minutes. The layer firms up just enough to make adding additional layers much simpler. Hi Stephanie, the amount of heavy cream for this recipe is 1/2 cup. Sorry, that was omitted and my error will be fixed shortly. There is no need to place the bottom layer in the fridge to firm up, it won’ move. If you decide to add more layers of cookie mixture, then yes, chilling it will help. But I didn’t layer more than the bottom row and it did not move out of place in any jar when the filling was added. I’m finding I love trying to impress family and friends with desserts, which are typically quicker to whip up than a full scale dinner! Plus, it’s an excuse to get together and hang out. These are perfect. The recipes needs 1/2 cup heavy cream it was omitted in the initial recipe, it will soon reflect the change. Sorry for my mistake. it’s 1/2 cup. Just edited the recipe card. What size cream cheese packages, 3 or 8 ounce? Thanks. I was wondering if I could use another kind of cookie, some in the family do not like choc chip(sicko’s). since the recipe calls for brown sugar with the choc chips, would I have to change to white sugar, if I can use another cookie? appreciate your help and you have great great, RECEIPES! Hi! Love the recipe! Quick question though- if I didn’t want to make individual desserts, what size pan would I use for this amount? Thanks!